The Greensboro Four | Kid Reporters' Notebook | Scholastic Inc. 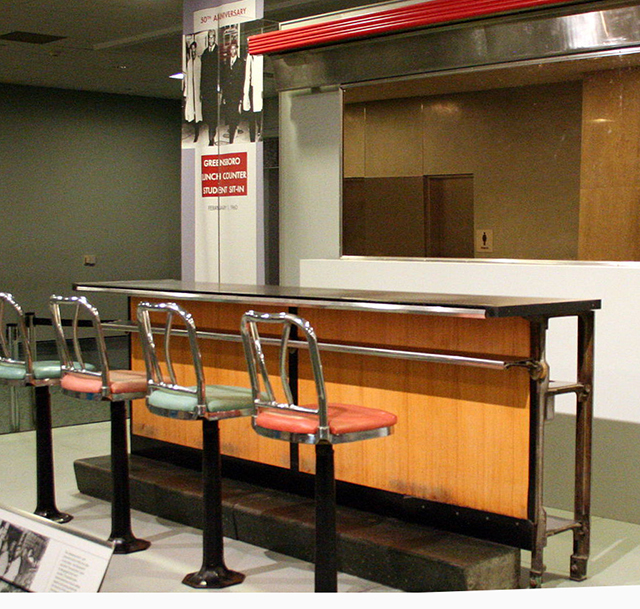 This segment of the Greensboro lunch counter where students staged sit-ins in 1960 is on display at the National Museum of American History in Washington, D.C.
On February 1, 1960, four college freshmen in Greensboro, North Carolina, stunned the world by a simple act. Franklin McCain, Joseph McNeil, Ezell Blair Jr., and David Richmond sat down at a “whites only” lunch counter at the local Woolworth’s. The young black men politely asked for coffee. When told that they would not be served, the friends sat peacefully until the store closed. This quiet act of rebellion sparked a series of sit-ins across the South to end racial segregation. “It became what we call a ‘spark’ that was created here, and it spread like wildfire across North Carolina,” says Cassandra Williams, a guide at the International Civil Rights Center & Museum, which is in the same building that once housed the Woolworth’s. From February 1 until July 25, 1960, the “Greensboro Four,” as they became known, staged a series of sit-ins. They were joined by tens of thousands of students, both black and white. Even people in the North, where Woolworth’s lunch counters were not segregated, wanted to support the movement. On July 25, 1960, the Woolworth’s lunch counter in Greensboro was finally integrated. People of all races could sit together to eat. But it would take a few more years for every business in Greensboro to take down the “whites only” signs for good. The Greensboro Four sat down not just for themselves. They wanted to create a better world for everyone. Such acts of courage still inspire us today.